Inspirational Tips for a Timeless All White Wedding Design! There’s something so timeless about a wedding designed with an all-white palette. 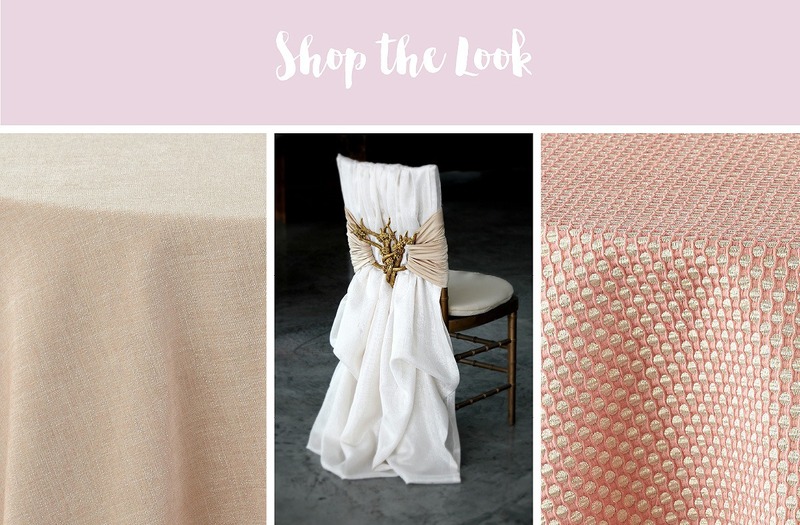 The look, while classic for weddings can also be great for modern weddings and boho weddings too! 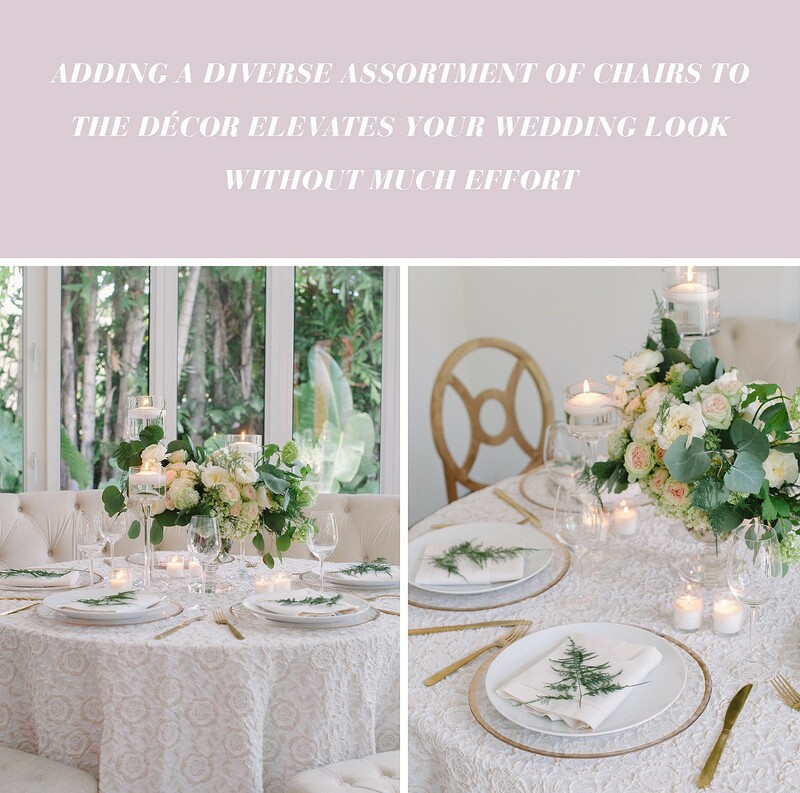 So long as you make sure that you aren’t letting it fall a little…flat…all-white décor can set the tone for unique wedding accents and beautiful wedding flowers. 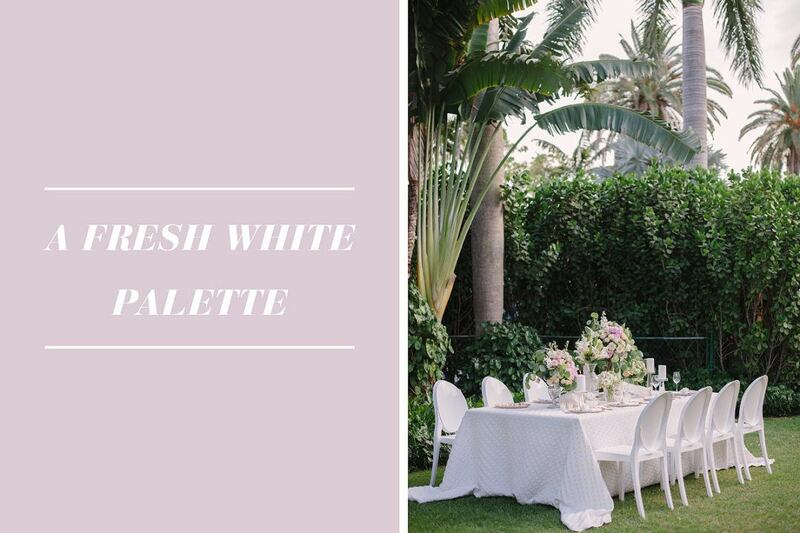 In the spirit of embracing a fresh white palette and seeing what kind of great wedding ideas can come from it, we’ve put together some of our top styling tips for an all-white wedding design! 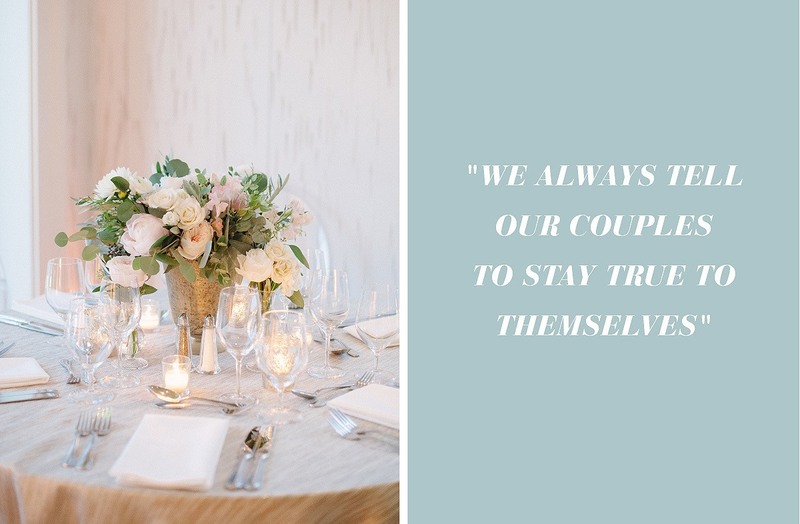 Scroll through to see what our team has to share and get inspired for your wedding! White can be a great base for your event, use it across your tabletops to unify the space but consider mixing the styles and textures on different tables to add an interesting dimension to the room. If you have an overlay in the mix, consider using a solid linen to complement the other design. 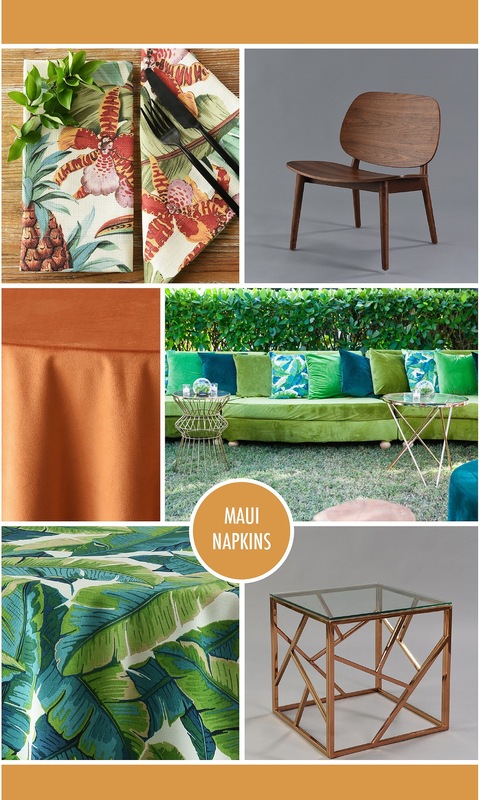 If you prefer a uniform linen look, play with the tabletop accents instead! 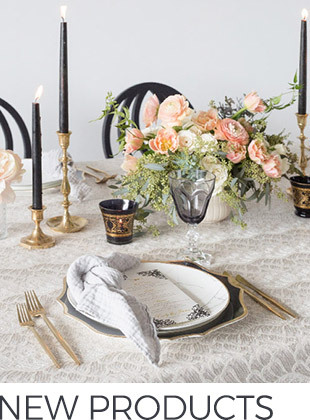 White linens can be a blank slate for patterned china, elaborate menu cards, napkins in elegant designs and bright colors and innovative floral arrangements. 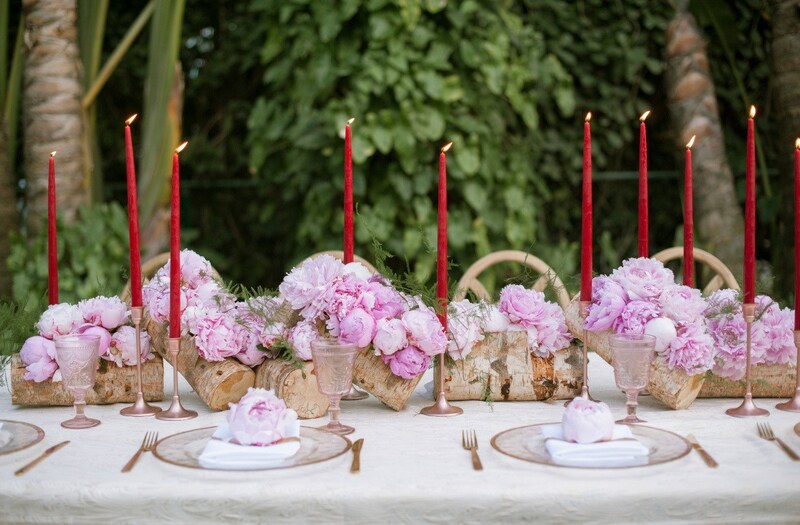 Or if you’re feeling really bold, how about bright red taper candles down the table? Let your creativity flow! And it’s not just on the tabletop where you can have some fun, adding a diverse assortment of chairs to the décor elevates your wedding look without much effort. 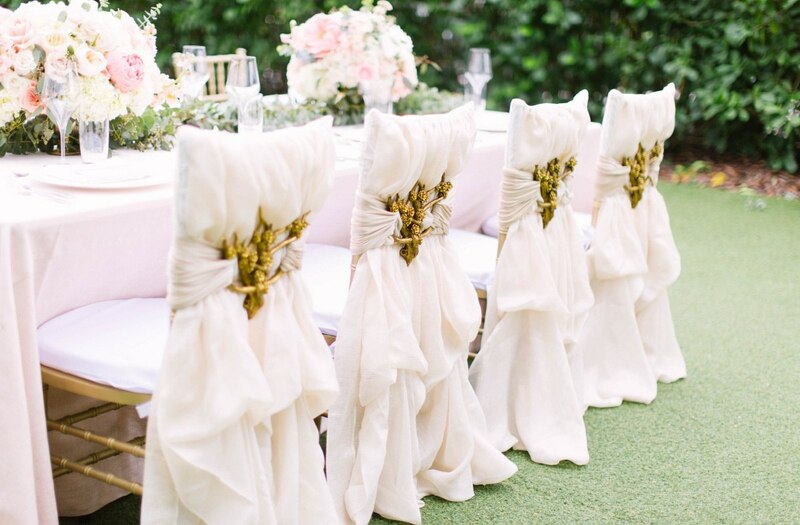 Consider specialty chair rentals or using chair covers for chiavari chairs in the mix. Combining a furniture piece, like our Ivory Sky Sofa, with chairs can also create an intimate dining experience for guests. If you’re going for a minimalist modern wedding look, we love optic white accents! Consider using high-gloss pieces, like white acrylic vases or white acrylic chairs, to add an element of shine. 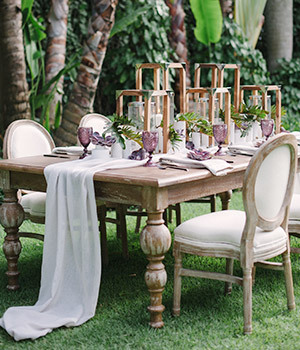 For a more boho wedding feel, white and wood are a perfect match. Wood can soften bright whites giving the night a rustic and romantic feel. Extra points for mixing in flickering candles and oversized crystals with this one! season! A touch of rose gold on your dinner plates or chargers can add just the right amount of metallic. timeless! You can take it through the seasons, use it indoors or outdoors and no matter what your venue. So have some fun with it, we promise you’ll come up with a beautiful all-white wedding design every time! 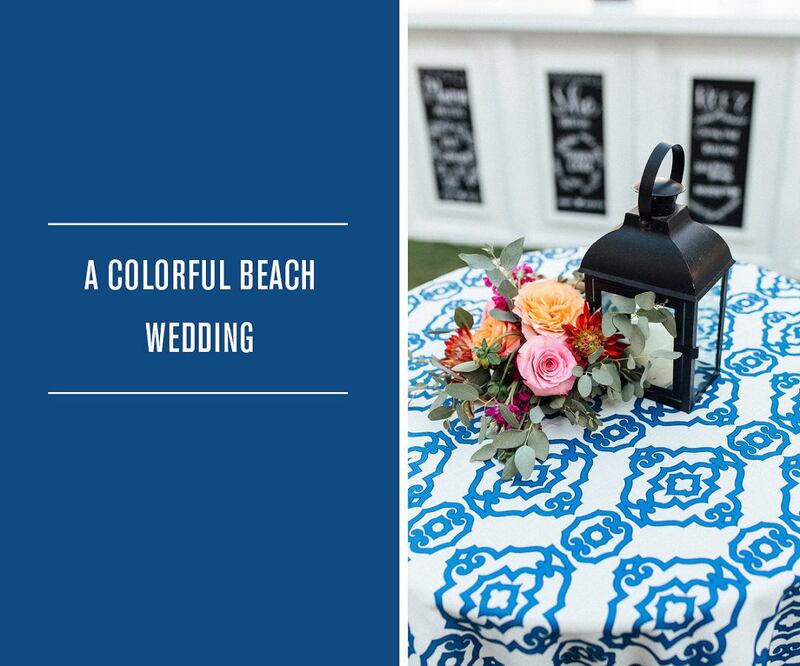 Colorful Wedding Inspiration for a Beach Wedding! Beach weddings in Florida never fail to delight us! 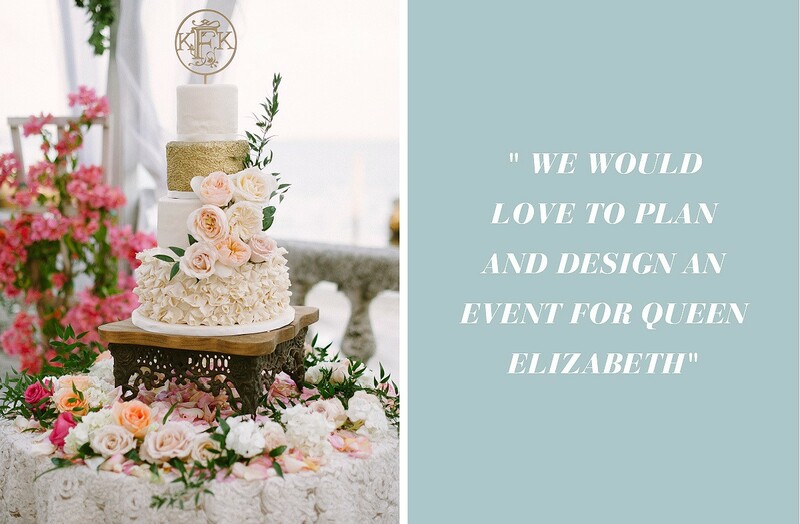 Whether it’s a destination wedding on Florida’s Atlantic Coast or a local’s Gulf Coast wedding, they are always guaranteed to be gorgeous and this Florals by the Sea affair is no exception! beautiful ceremony space. 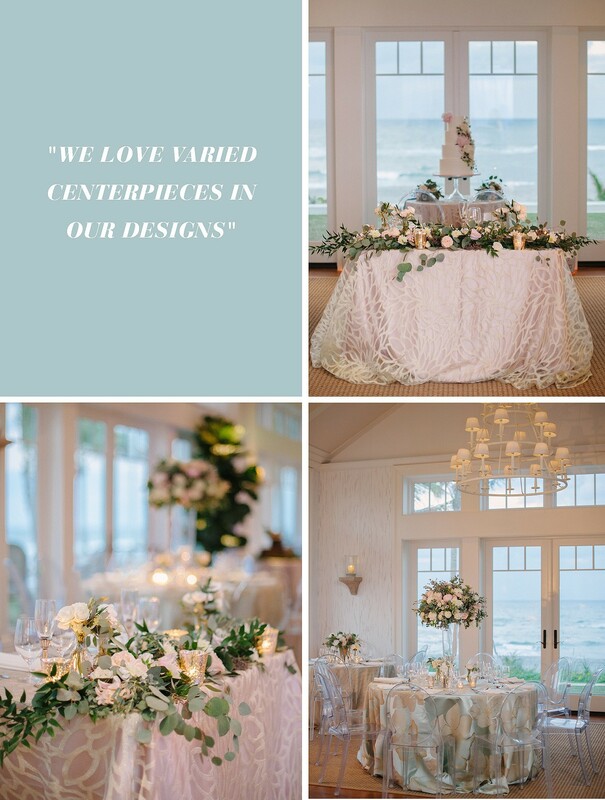 The ceremony’s flower arrangement in bright shades of coral was tempered by soft cream and sea green colored flowers and accented by sheer curtains blowing romantically in the ocean breeze. From the “I Do’s” on Rosemary Beach, we went straight to the reception! 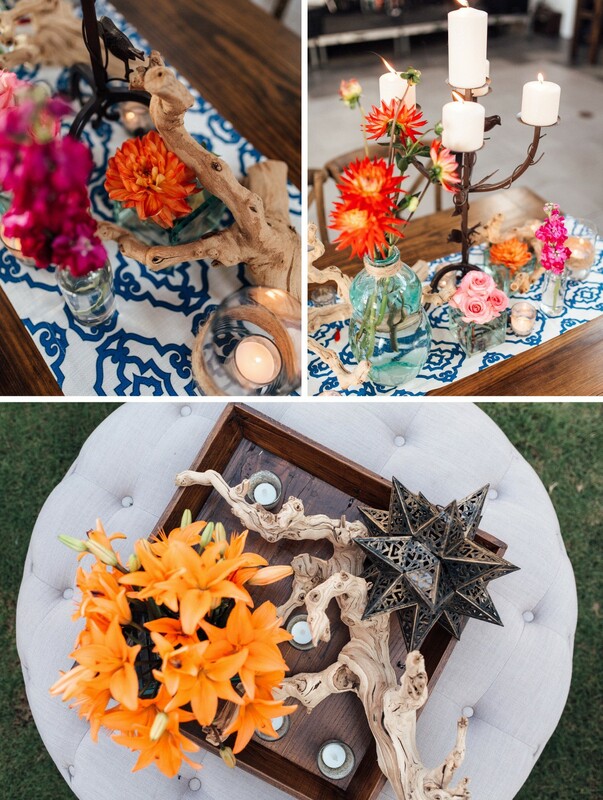 We love how this party brought in bold, colorful design accents to brighten up wooden tables and chair elements. The tables were set with a combination of our Royal Papel Chino pattern in runners and high top linens scattered throughout the venue. coral, fuchsia, orange and blush pink, Sally LaCourse of Florals by the Sea created a bright setting! We love how the flowers are set throughout in an assortment of glass vases and mixed in with natural elements like twine-wrapped candleholders and pieces of driftwood. And as with any great wedding, let there be cake! This naked-style cake from Confections on the Coast was a perfect sweet treat to end the night. The sugar flowers were made to match the wedding florals and they pulled it off deliciously! 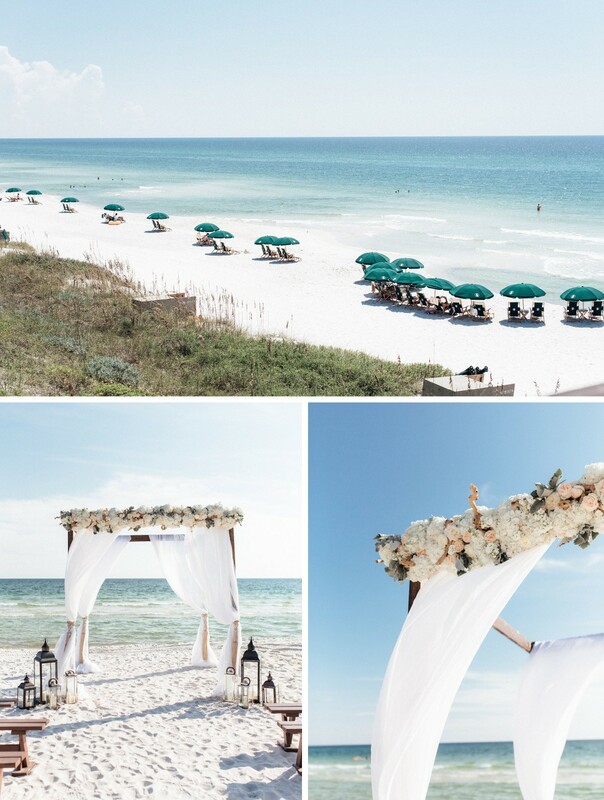 From it’s bright colors to its sugar sand, this is definitely another gorgeous wedding on Florida’s gorgeous Emerald Gulf Coast! 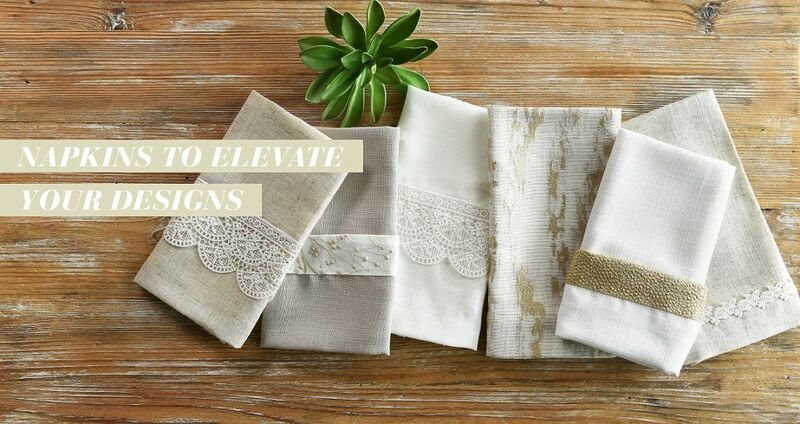 Napkin Designs to Elevate your Event Design! You already know, it’s all about the details when it comes to designing an out-of- this-world event (case in point: stellar parties like Engage!2017)! If you’re looking around thinking, “I’ve got it covered, every little thing looks amazing,” then kudos to you! But, let us ask you one thing before you go…what do your napkins look like? supposed to actually wipe their mouth with the napkin – which, by the way, yes they are! 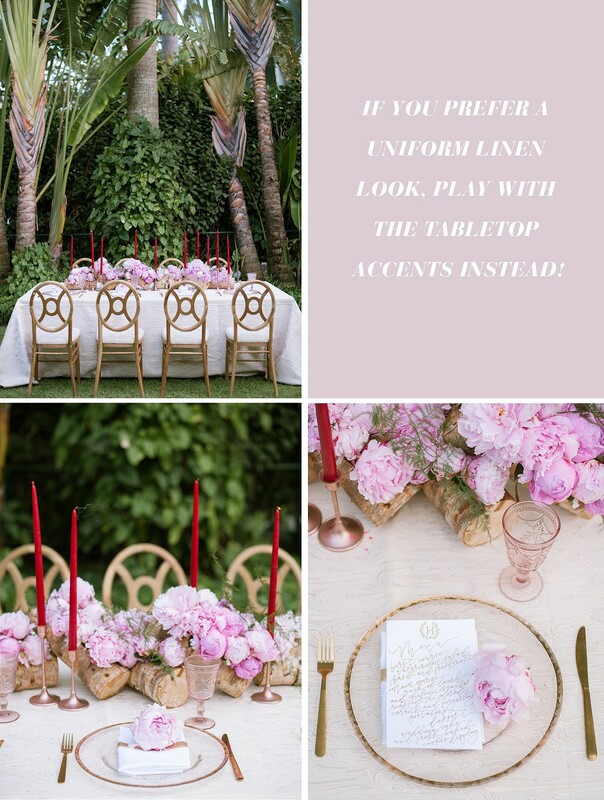 So, if you’re ready to take your tabletop design to the next level, scroll through to see just how to complement your event theme with a pretty little napkin! 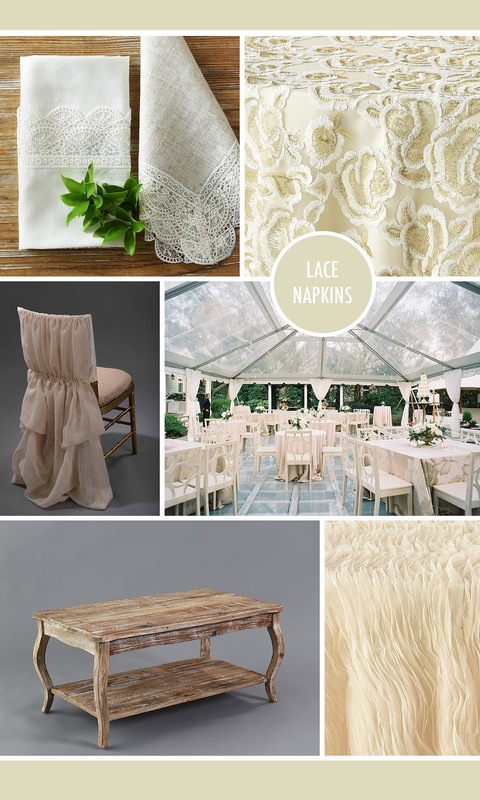 cream-colored linens like the Parchment Tulle Wave, Gold Emma and Beige Velluto. Complete the look with the Ivory Athena Chairback and accent with furniture like our Vintage Wood Coffee table. Velluto, Lipstick Velluto or Palm Springs print. Give your guests a place to lounge using our Rose Gold Cage Side Table and midcentury modern inspired Walnut Chair. Dining Table with a runner in our Shell Tuscany. 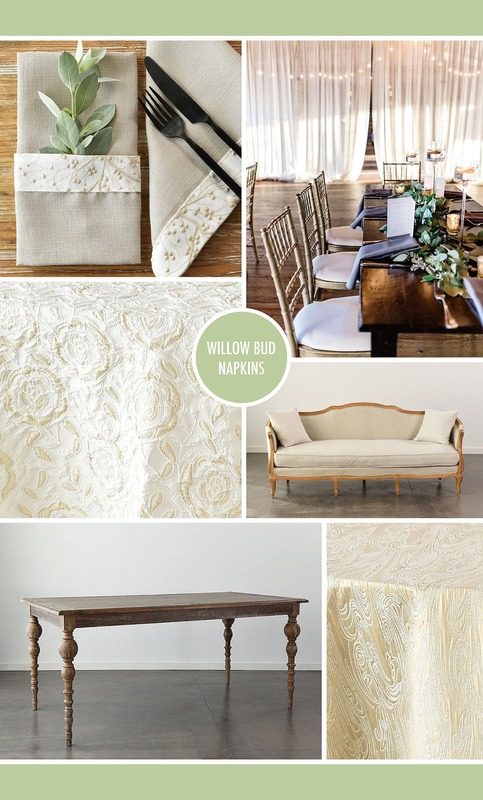 If you’re adding wedding lounge furniture, consider country inspired pieces like our Maison collection sofas. well with a blue and yellow palette. 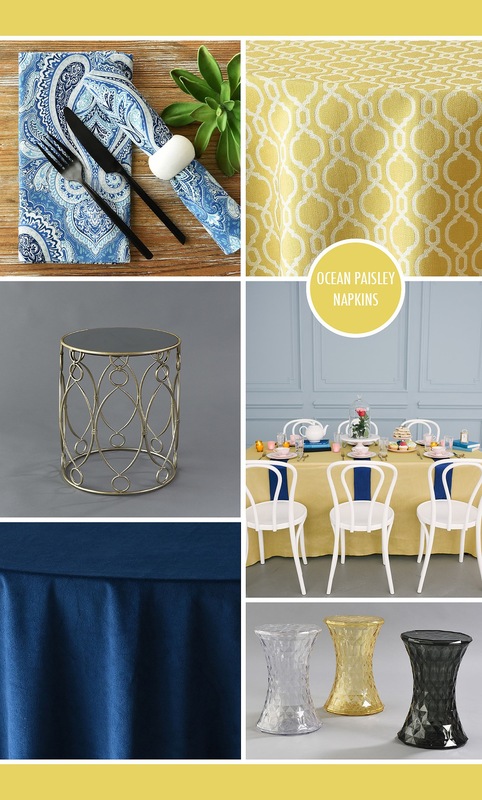 We love this blue paisley print napkin played against a geometric pattern, like the Yellow Papel Chino or Marigold Venetian. If you’re looking to go all blue it matches nicely with the Indigo Velluto. Keep the design fun with our White Mirage Chair and Iron Side Table! 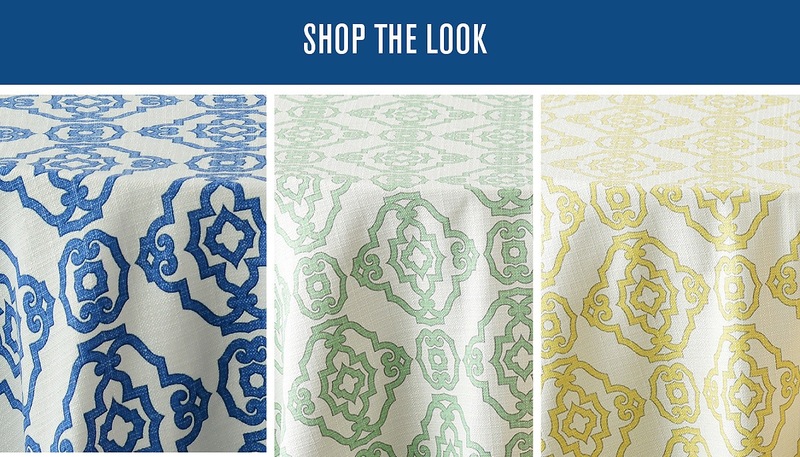 bringing in a soft abstract pattern on your napkin to pair with neutral linens. 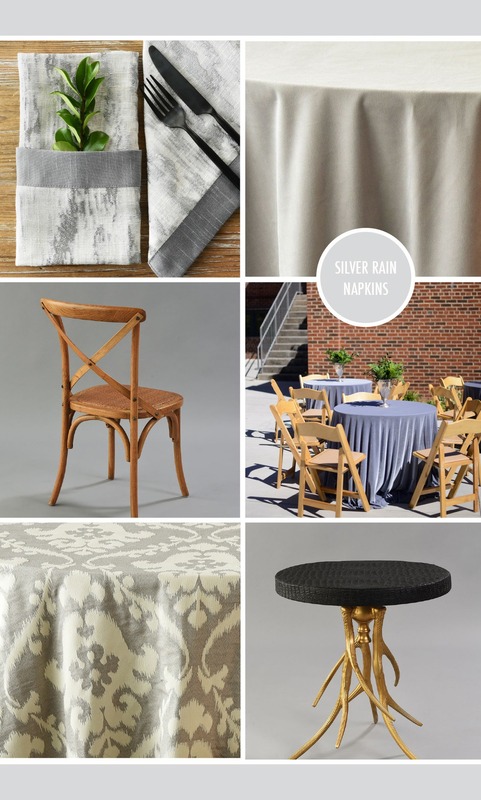 The Silver Metallic Faux Dupioni and Gray Western are great solids warmed up with metallic elements. If you want to bring in some pattern, the Grey Palomino has a nice ikat pattern! Bring in wood accents in furniture, like the Oak Chair or Silver Aspen Table with Cognac Croc Cover, to create a cozy atmosphere for guests. colors or even napkin décor, look around to make sure you make every detail count! It’s a beautiful day at the W Hotel South Beach in Miami, FL! Don’t believe us? 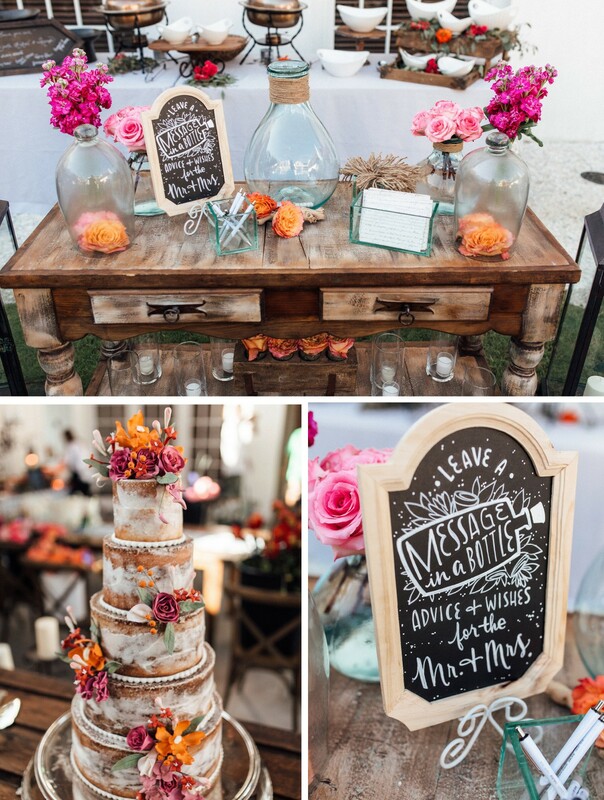 Just check out this gorgeous blush design set by The Creative Loft in their garden! We could hardly contain our excitement seeing this perfectly delicate yet deliciously lush setting, photographed by Alee Gleiber Photography, giving us major brunch inspiration (and you know how we love brunch!). 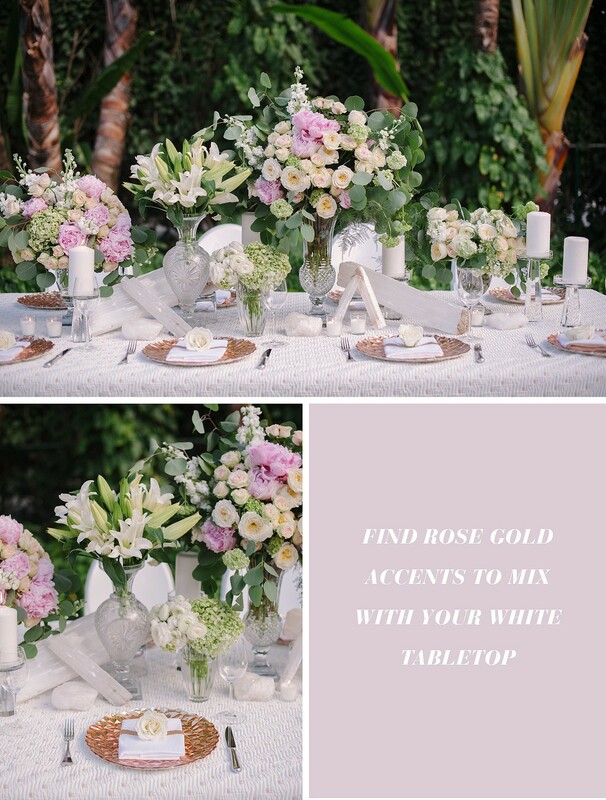 Atop this table for eight, set with our Rose Metallic Burlap linen, we were delighted by bright florals, from Primerose Florals, alongside aromatic sprigs of eucalyptus. 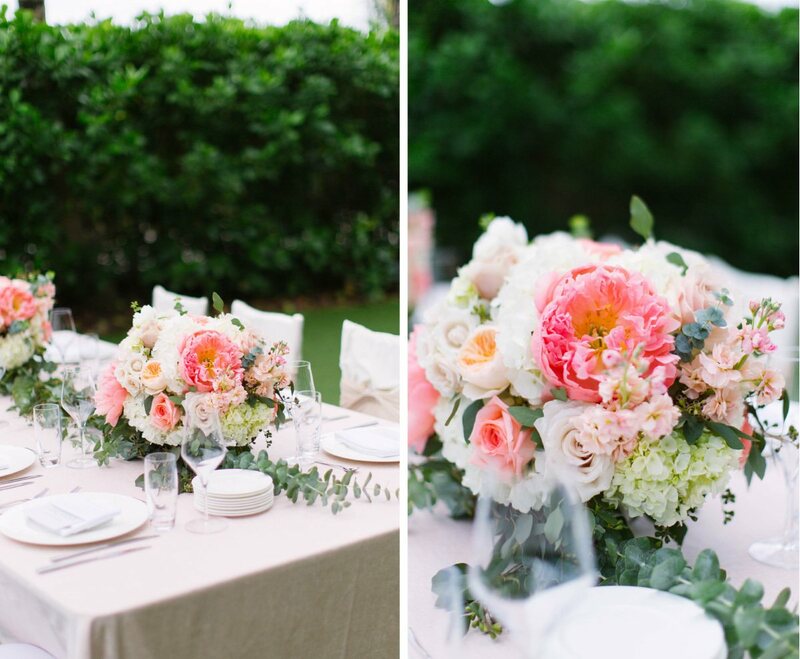 Just look at those blooms bursting in bright corals and light pinks, a perfect color palette for an intimate brunch or wedding celebration! 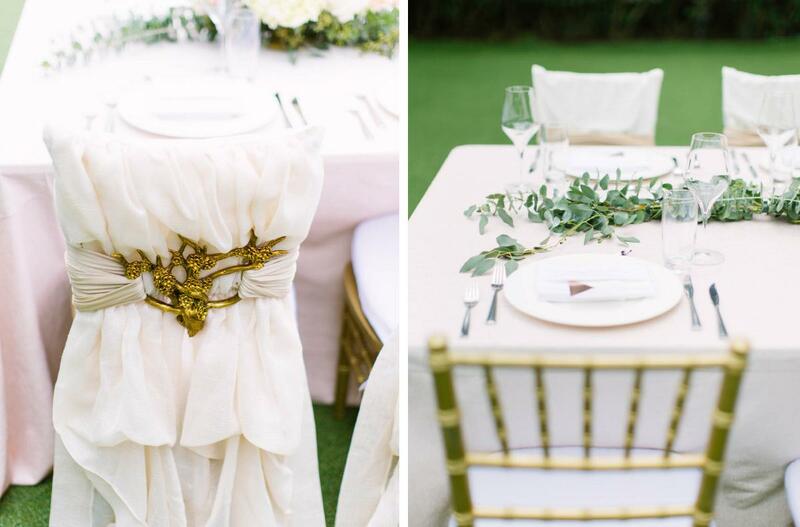 We love the eclectic touch in the chairs, mixing some of our decorative Ivory Athena Chair backs and Gold Blossom Interlaces with timeless gold chiavari chairs. And the setting could not have been any more perfect! 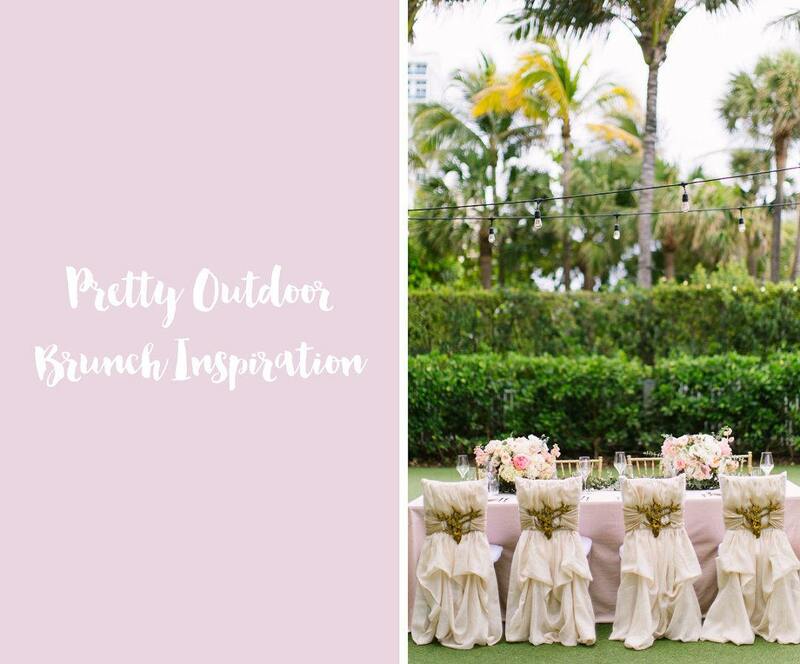 The W South Beach hotel, a destination for weddings and events alike, set the scene with it’s palm trees strung with twinkling string lights, an ideal place to transition from brunch to dinner without missing a beat. There truly is nothing like a Miami celebration! Nuage Designs: One of your very unique differentiators is that you’re a husband and wife team – how did that come to be? Did you work together elsewhere before starting Masi Events? 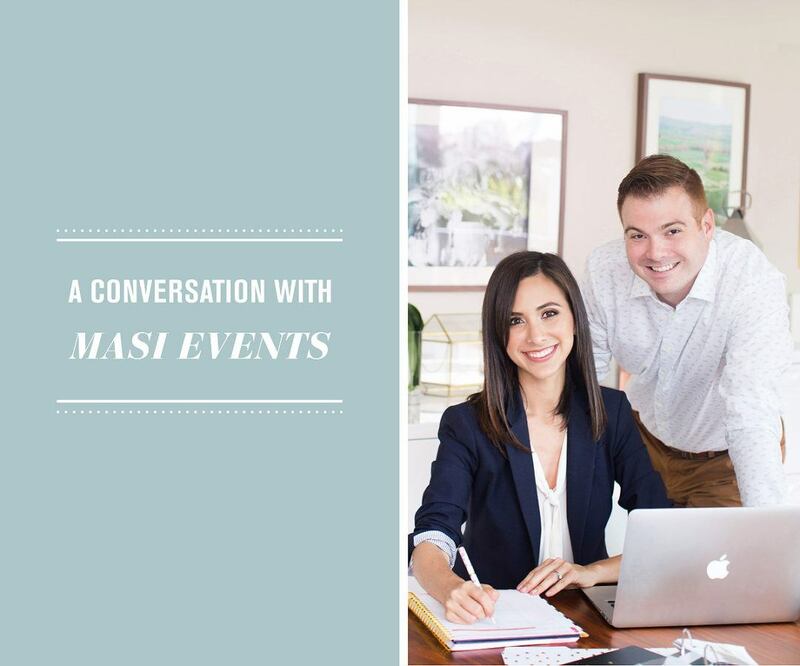 Masi Events: Michael and I come from two different backgrounds professionally. Early in my career I was working for another event planning firm mostly focused on corporate events and non-profit events. Michael was working for a recruitment company. I then started the company in 2008 mostly focused on weddings and social events. We then relocated to Miami in 2010 and it was a natural transition for Michael to come on board full time. He was already assisting me on weddings and events over the weekend and was really enjoying the work. Especially with the long hours it definitely made spending time together so much easier. ND: What, in your opinion, is the best thing that you bring to your newly-engaged couples as a husband and wife duo? ME: I think there is definitely a level of comfort to many newly-engaged couples, who see a married couple working together, being successful together, and having fun doing it. We also can offer perspectives from both a male a female point of view, which more and more often now is needed, as grooms tend to be playing a much larger role in the planning process. ND: Many clients comment on how you both balance each other out, how does that guide the roles each of you plays in the business? ME: Definitely, we have different strengths given our professional and educational backgrounds. I am much more the creative, and Michael tends to be much more analytical. 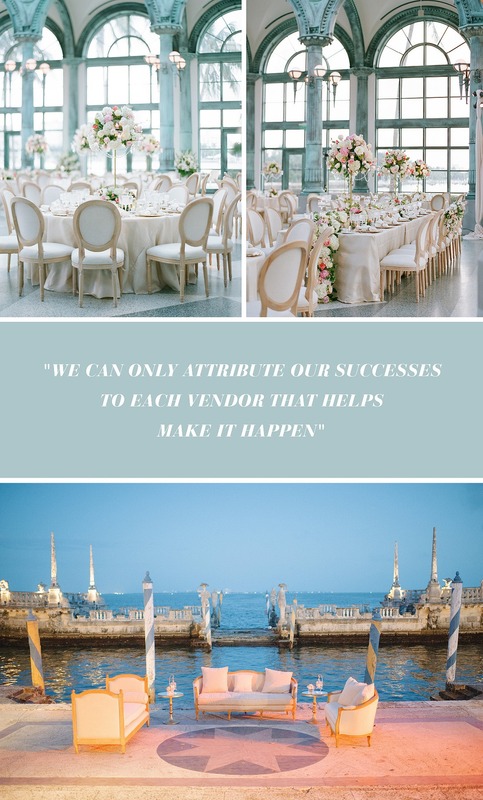 We typically divide the vendor categories we are responsible for given our strengths, for example I will typically work with the Florist, Invitations and Linen Vendors, and Michael will work with Hotels, Venues and Logistical Planning. He makes the best, most detailed timelines! That is where his official title of “logistical mastermind” came to be. When you put it together our clients benefit greatly from to experience professionals with a knack for different things. ND: How is the collaboration process with your clients? Where does the basis for their wedding begin (mood board, conversation, color palette, etc)? ME: We typically gather information from our clients organically finding out what their aesthetic is like and what has meaning to them. They sometimes have a very clear vision of what they are looking for and other times they need more guidance. Based on their ideas we put together a design board and once they approve it and it captures what they are looking for we then start the vendor selection process. ND: What is your advice to couples that do come to you with a “trendy” design in mind? ME: We always tell our couples to stay true to themselves. This will achieve the most timeless of designs and one that will resonate with them for years to come. If they are just following trends they will easily have regrets on their choices. ND: Do you ever find it difficult to push clients away from “trends” and towards a more unique design? ME: Yes, sometimes the more unique designs are ones that you might not necessarily have a photo of but it’s only a conceptual concept and you describe it and draw it out. This is where having trust in us comes to play because they might not be able to visualize it as much as seeing an exact photo of it. ND: We hear that you show a lot of “vendor love” when recommending to clients (thank you! ), why is that important to Masi Events? ME: We find our relationships with our vendors are extremely important. We can only attribute our successes to each vendor that helps make it happen. If one of us succeeds we all do! ND: What are some of Masi Events’ trademark styles? ME: We love varied centerpieces in our designs. This creates a more dimensional event. 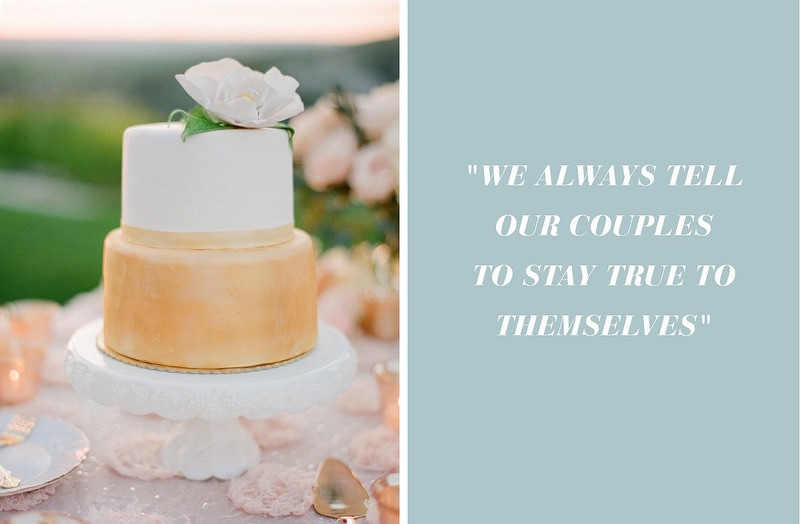 We also find that our portfolio of weddings are so varied just because truly we try to achieve a unique experience and design each time that is reflective of our couples. ND: If you could plan and design a party for anyone in the world, who would that be? ME: We would love to plan and design an event for Queen Elizabeth. I think there is so much protocol and rich history there that it would be so fulfilling. She has seen it all and has been to so many events so to be able to amaze or surprise her would be very rewarding. But, we would also love to plan and design an event for Ana Wintour. She is so iconic and to be able to amaze or surprise her after attending so many events would be very fulfilling and rewarding. I’m slightly obsessed with the documentary the First Monday in May. ME: I love that it is never boring and never the same. 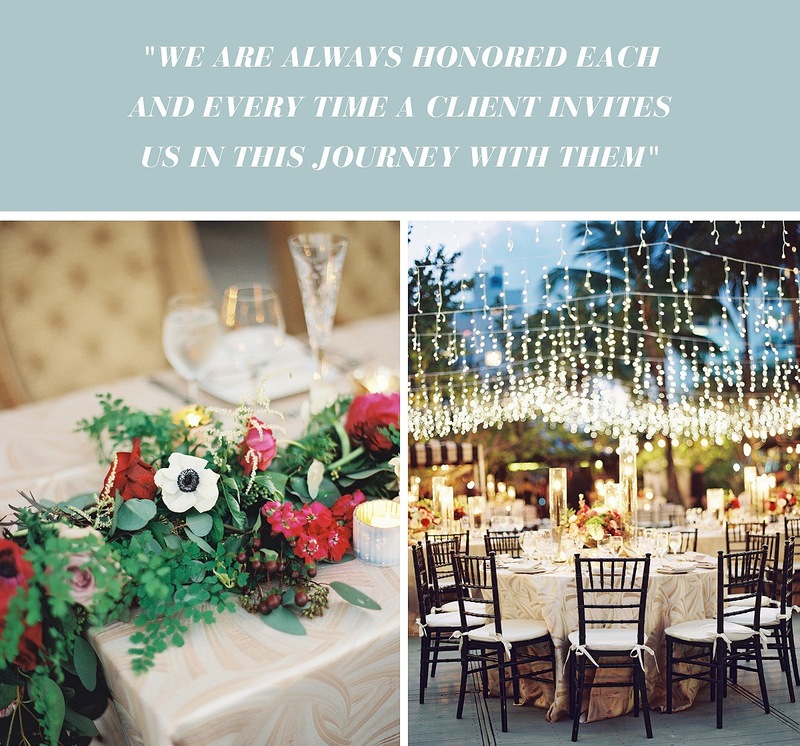 It really is such a personal event for our client’s lives and one that we want them to cherish not only the wedding day but the entire planning experience. We are always honored each and every time a client invites us in this journey with them. ND: Last one, because we have to pick your brain while we have you, what trends do you see for the fall wedding season? Any color palettes or themes that you’re dying to use? ME: Some trends we are seeing is a focus on lounge furniture and varied seating for guests. Clients are less afraid of using color and being bold. I think you will see a more diverse color palette. 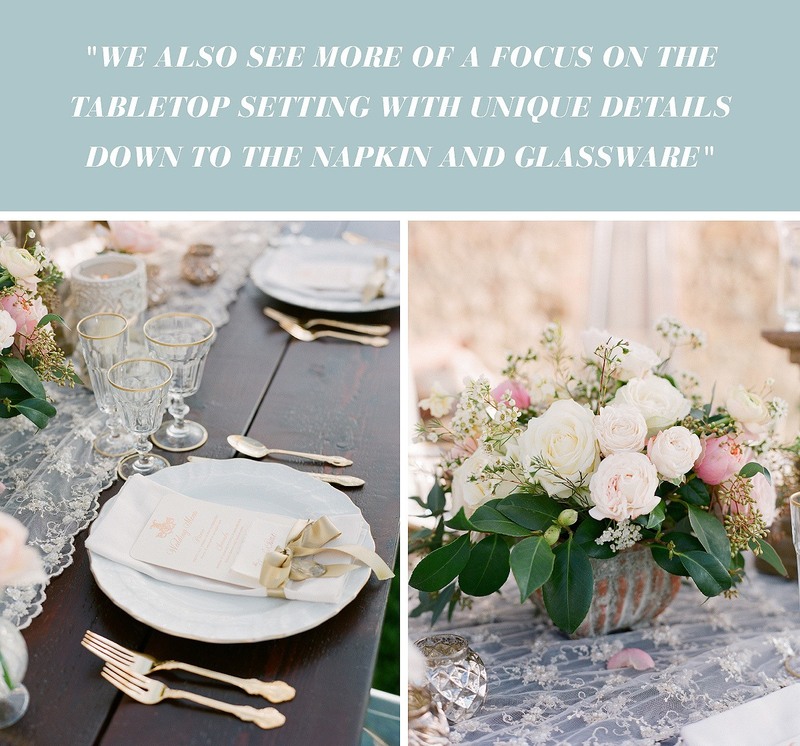 We also see more of a focus on the tabletop setting with unique details down to the napkin and glassware. With wedding season just around the corner, we can’t wait to see what Masi Events has in store for us! Stay tuned and follow along to catch some of their work on our Instagram.